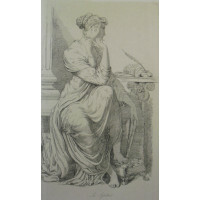 Original Etchings by Sir George Hayter. Forty-Six Etchings. SIR GEORGE HAYTER [1792-1871] Artist. 'Vaisseau du Premier rang portant pavillon d'Admiral.' Ship in profile, near coast. After a design by Henri Sbonski de Passebon [1637-1705]. 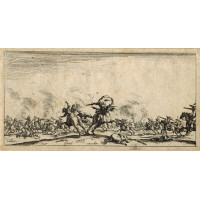 JAN VAN VIANEN [1660-1726] Dutch Engraver. Les Combats de Cavalerie. Pair of Battlescenes, one with central figure firing pistol , the other, cavalrymen with standard bearer to right. JACQUES CALLOT [1592-1635] French Painter and Etcher.